Commentaries by Chas. W. Freeman, Jr.
After two decades of hostile confrontation, China and the United States initiated negotiations in the early 1970s to normalize relations. Senior officials of the Nixon, Ford, Carter, and Reagan administrations had little experience dealing with the Chinese, but they soon learned that their counterparts from the People’s Republic were skilled negotiators. 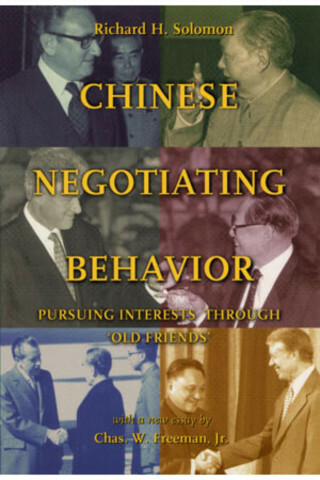 This study of Chinese negotiating behavior explores the ways senior officials of the PRC—Mao Zedong, Zhou Enlai, Deng Xiaoping, and others—managed these high-level political negotiations with their new American “old friends.” It follows the negotiating process step by step, and concludes with guidelines for dealing with Chinese officials. Originally written for the RAND Corporation, this study was classified because it drew on the official negotiating record. It was subsequently declassified, and RAND published the study in 1995. For this edition, Solomon has added a new introduction, and Chas Freeman has written an interpretive essay describing the ways in which Chinese negotiating behavior has, and has not, changed since the original study. The bibiliography has been updated as well. Richard H. Solomon has had extensive experience negotiating with East Asian leaders. As assistant secretary of state for East Asian and Pacific affairs, he negotiated the first UN "Permanent Five" peacemaking agreement, for Cambodia, and led U.S. bilateral negotiations with Vietnam. Solomon has been president of the United States Institute of Peace since 1993. He is the author of seven books, including Chinese Negotiating Behavior: Pursuing Interests Through "Old Friends" (USIP Press) and coauthor of American Negotiating Behavior: Wheeler Dealers, Legal-Eagles, Bullies, and Preachers (USIP Press).